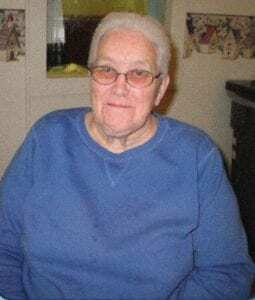 Ellen A. Genzler, 83, of Gettysburg, died Thursday, March 1, 2018 at the Avera Oahe Manor. Funeral services will be 11 a.m., Saturday, March 10 at Emmanuel Lutheran Church, Gettysburg, with Pastor David Otten presiding. Burial will follow in the Gettysburg Cemetery. A prayer service will be 7 p.m., Friday, March 9 at the church, with visitation one hour prior. Ellen Anna Genzler was born Jan. 29, 1935, in rural Potter County, SD, to George and Hannah (Strauss) Genzler. She attended school at North and Hillcrest rural country schools through the ninth grade. Following her education, Ellen helped her mom around the home before starting to babysit for area families. On Sept. 29, 1971 Ellen went to work for the Oahe Manor. She spent the next 21 years enjoying every minute that she spent there. She would volunteer to work any and all shifts; as she found joy working with the residents. Ellen retired on July 25, 1992. However, one could always find her taking time to stop by and visit the staff and residents. Ellen, Ellie or Elliemae, as called by many, was so proud to be an aunt, great aunt and great-great aunt. She would take time to babysit her nieces and nephews any time she was presented an opportunity. If she wasn’t watching them, she was sharing stories about them with anyone she could. Ellen also enjoyed her daily visits with her friends at the Burg and attending rummage and auction sales. She was a lifetime member of Emmanuel Lutheran Church in Gettysburg, and the VFW Auxiliary. Ellen’s life will be cherished by her siblings: Bertha Bartels, Loma, CO, Louie (Sieglinde) Genzler Sr., Aberdeen, Helen Stewart, Okmulgee, OK, Mary Genzler, Highmore, Shirley Genzler, Redfield and Roger (Nancy) Genzler, Gettysburg; sister-in-law, Elsie Genzler, Litchfield, MN; and numerous nieces, nephews, great nieces and nephews, and great-great nieces and nephews. She was preceded in death by her parents; siblings: Raymond, LuVern, Alvin, and Albert Genzler and Neola Anderson; brothers and sister-in-law: Jay Anderson, Inez Genzler, and Mervin Bartels; nieces and nephews: Aleaha, Justin, and Mark Genzler, Cindy, James, and Terry Stewart, Betty Ann Combellick, Slade Genzler, and Katelyn Tennant.